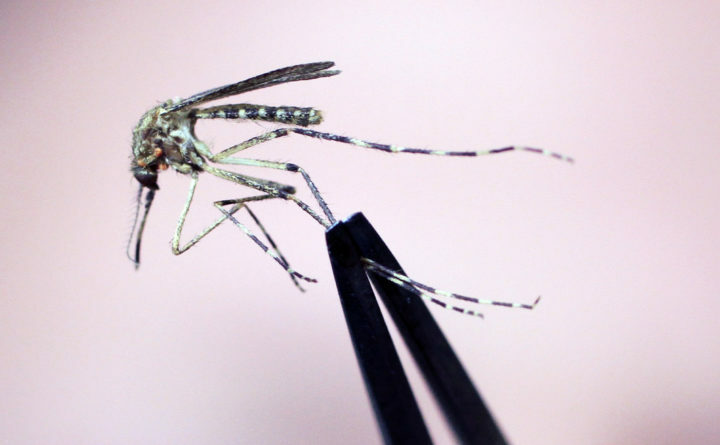 A Cattail mosquito is held up for inspection at the Maine Medical Center Research Institute in Scarborough, Maine. Maine officials say a horse in York County has tested positive for the mosquito-borne West Nile virus. The Maine Department of Agriculture, Conservation and Forestry says it’s the state’s first confirmed case of the disease in a horse on record. The virus is spread by the bite of an infected mosquito. The horse was not vaccinated against the disease. The animal was showing neurological signs last week. The department said it’s undergoing supportive veterinary care and is not a threat to infect other animals or people.